New York City streets will see an added touch of terror during NYCC Super Week when ReedPop, Uber, and Chevrolet team up to put drivers in the seats of WYTCHES-wrapped Sonic Chevrolet cars, today through October 7th. Scott Snyder and Jock’s WYTCHES #1 will arrive in stores on October 8. 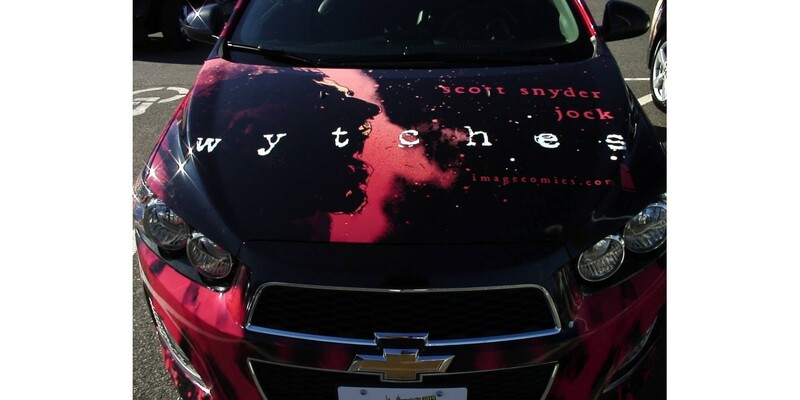 Comic Con fans will also have a chance to win exclusive access to great prizes and collectables thanks to the Chevrolet and Uber partnership, including free Image Comics and lucky grand prize winners may take home a signed copy of WYTCHES #1 by Scott Snyder. Fans will also be eligible to win a trip to NYCC 2015 with VIP Tickets and a Chevy Car Exclusives Prize Pack through the “Chevrolet Gives You the Keys to NYCC” contest. Starting today, fans are encouraged to post creative photos of the cars to Twitter and Instagram, using the hashtags #ChevyNYCC, #NYCC and tag @imagecomics. Following the completion of New York Comic Con on October 13, NYCC and Chevrolet will pick the 10 best photos as finalists.